25 x Yellow Shrink Connectors: Diameter 6.0 mm, Cable cross-section: 4.0-6.0 mm2(A.W.G:12-10). Solder and Hot Melt Adhesive inside can be perfectly Waterproof. You can control the operating temperature and heating time. Measure your wire, and easily choose the right connector by looking at wire size chart on the box. When heat is applied, polyolefin tubing reduces in size and adhesive flows inside the insulation. Dual walled tubing ensures waterproof seal and prevents wire corrosion. Waterproof and Durable- Dual-walled design, polyamide hot-melt material protects splices from water, moisture, condensation, salt and corrosion. Unlike other connectors with brass or tin inner cores, our cores are copper silver plate, high quality for seal waterproof. No Slip Wire-Contact,tubing reduces in size and solder will melt and flow through the stripped wires, ensure strong holding --- your wire will never slip out of the connector. Can be ideal used in marine and automobile applications. Fast And Easy Soldering Process-Just strip your wires, insert them into the connector and apply heat, our wire connectors melt within 10-15 seconds. Even for a beginner, you can get a solid seal to your connection. Easily Choose Right Connector-Color coded tubing makes it easy to identify the right size of the connector for every application. Measure your wire, and easily choose the right connector by looking at wire size chart on the box. 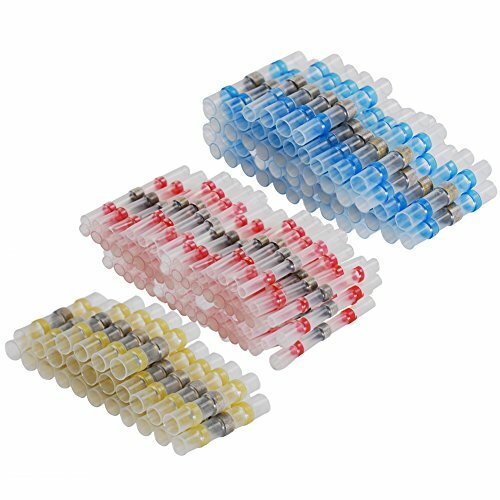 Package include-65 Red Shrink Connectors,60 Blue Shrink Connectors,25 Yellow Shrink Connectors. If you have any questions about this product by HIFROM, contact us by completing and submitting the form below. If you are looking for a specif part number, please include it with your message.